This is my first week of proper barefoot running with the majority of my runs all totally barefoot. First run was on Monday around 1.5 miles and the second on Wednesday I managed to increase that to 2 miles. Feet are still hyper sensitive and the discomfort limits how far I can go, I guess this is a good thing forcing me to work on my form. Running on the muddy trails is no problem at all, still have to be mindful of whats under my feet but it’s generally ok. The route I have been running has a gravel section on it and that’s a different matter, I have to practically pigeon step my way along it and will divert to the grass occasionally if it all gets too much. Friday I went for a run in my Xeros just so I could get a reasonable distance in, however I still made sure my technique was correct and kept the pace easy so I didn’t get sloppy. I (along with my wife) are both a week into the Paleo diet and that has been having an impact on my energy levels, going cold turkey off coffee, Haribo and Relentless and any other caffeine/high sugar product made me feel for the first few days like my head was going to explode but I am getting there and am now feeling much better. I am looking forward to see how this benefits my running along with the barefooting. 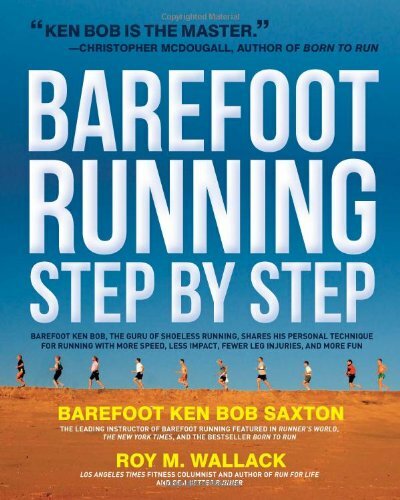 I have always liked the idea of minimalist running but never really got into the idea of totally barefoot running, however recent experience with injury, plus reading Barefoot Ken Bob Saxton’s book, Barefoot Running Step By Step (Barefootrunning.com), has drastically altered my understanding and my perspective. I was always under the impression that what I should be doing was running in the minimalist shoes to make the transition to zero drop ‘barefoot’ shoes, this seemed logical as I had always run in normal shoes before. Kens book makes a sensible point when you sit back and think about it, essentially running in barefoot shoes is not running barefoot, they are still shoes and looking back on my time running in minimalist shoes it does ring true, it really isn’t like barefoot because you don’t realise when you are not running correctly. I have spent most of my time running on the ball of my foot putting too much strain on my calf muscles (rather than relaxing them), pushing off the ground (rather than lifting) and slowly overtime worn my body down to the point where it is just one injury after another. I have already completed my first proper barefoot run, leaving my house with no shoes and returning with no shoes and I can say that the experience was exhilarating, albeit “painful”. I say “painful” as it’s not like pain in the classic sense, its like the feet are being overloaded with stimulation which they are not used to and it just gets to a point where the nerve endings can’t cope anymore. Also what I did notice was as per the book that if you are not running correctly you soon have to adjust as anything but correct form is uncomfortable. So after a dry spell of blogging, I have something to write about again in my journey from injured shod runner to (hopefully) happy barefoot runner.